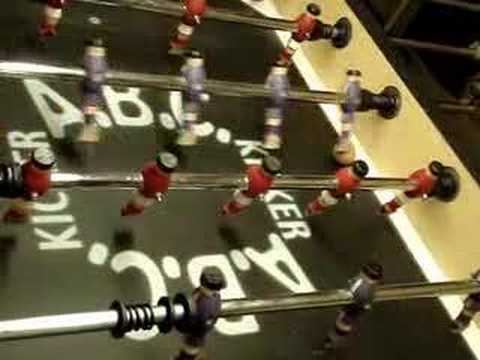 Foosball aerial shot by me on a Tornado table =] took some practice 0:22 Min. paar gute tricks 0:59 Min. voila c'est moi Alxsanka qui joue au baby chez un pote admirez l'artiste! 0:09 Min. Un peu de tout, comme le fromage belge! C'est pas Collignon mais bon... :) 2:23 Min. 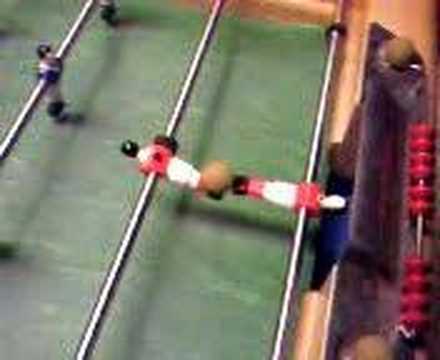 barre transversalle du defensseur aux baby foot 0:05 Min. Voila un petit freestyle du boscéen. Vous pouvez voir ces autres exploits dans mes autres vidéos. 0:10 Min. 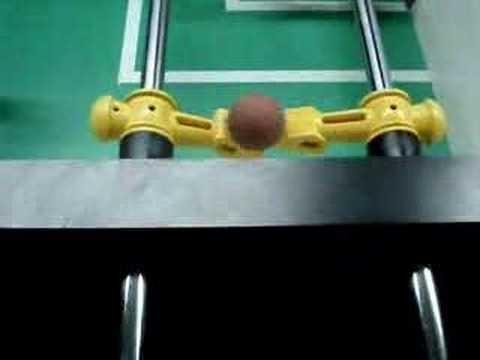 A video where is show a babyfoot trick, a kick back the ball, the ball hit the backwall, with his spin the ball go up and go directly into the goal. 1:14 Min. cendrier au baby de la pref par lucas 0:57 Min. Fancy Cristiano Ronaldo's stepovers or Ronaldinho's flip-flaps? Wait til you see this. 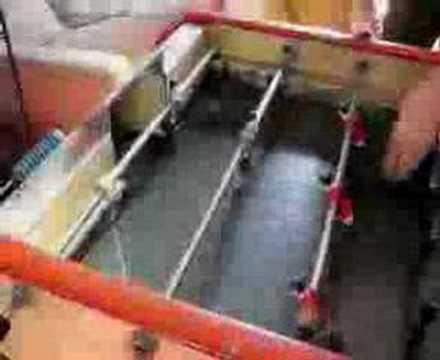 Advanced Foosball Shot: Fakey Push-Kick Shot performed by a Malaysian fooser. 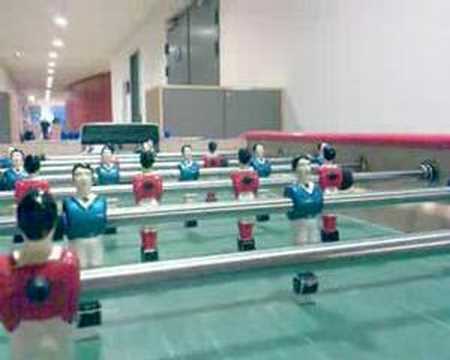 Visit http://www.foosball.com.my for more video clips. 0:30 Min. some aerial tricks from Hungary. original track was: crystal method-keep hope alive (6:03) 6:00 Min. 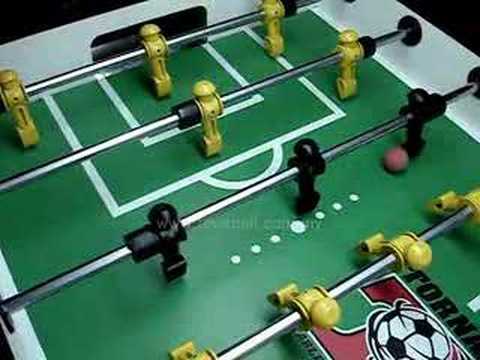 Garlando Foosball Aerials 1:50 Min. 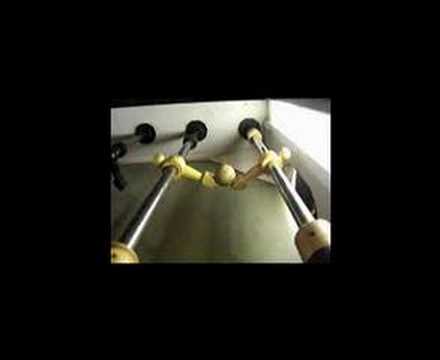 This is a re-edited version of the back wall aerial on a Garlando foosball table (with slow motion replay goodness). 0:29 Min. 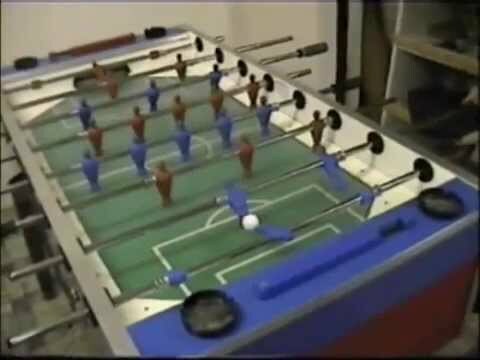 A couple of foosball tricks me and my friend did on my Eurosoccer table. 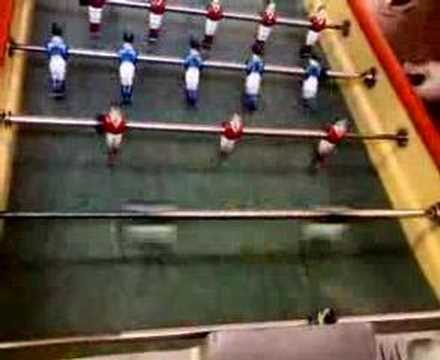 Fun to watch if you're out of inspiration or if you just like foosball. 1:51 Min. Trickshot by Ben 0:23 Min. Loby w wykonaniu zawodnika z Czech (polski rank- ama :]), Mi?dzynarodowy Puchar Jazzda Park! Manufaktura, ?ód?, 3.03.2007 1:20 Min. GRANDI NUMERI CALCIO BALILLA 1:30 Min. Ein paar Mitschnitte vom Kickern! 0:35 Min. Voila Pierro un pote du boscéen qui je vous l'affirme est cocu comme on peut le voir dans la vidéo lol. 0:21 Min. 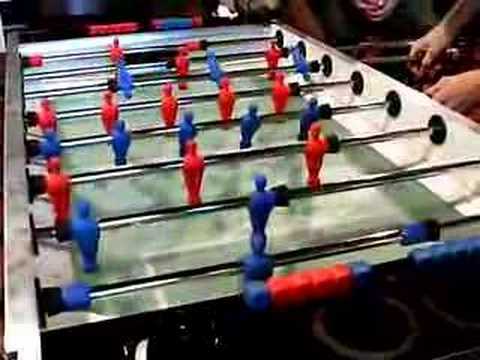 2 coups imparables par les rois du babyfoot 0:15 Min. realisé par moi 0:10 Min. Schauts euch mal an is ganz lustig zwar nich hochprofessionell aber ganz ok 3:00 Min. 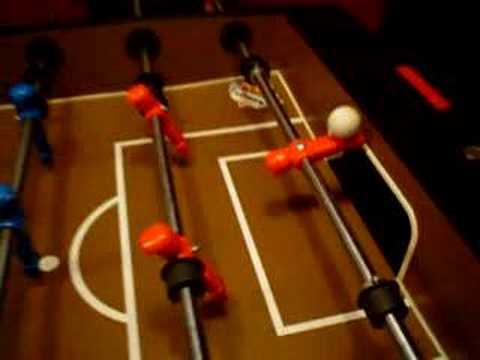 some good action on a fussball table, score a goal!! from the back with a flying ball 0:13 Min. 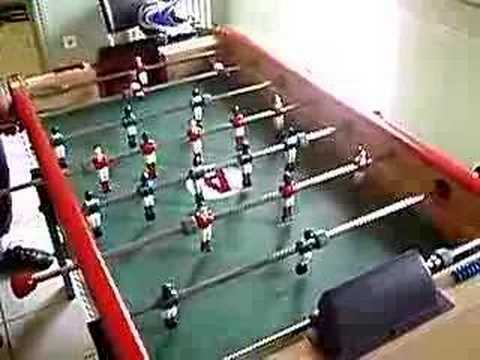 Tischfußball ist eine Sportart, die auf einem Spielgerät gespielt wird, das Kicker, Kickertisch, Tischfußball(tisch), Kickerkasten oder auch Wuzzler genannt wird. 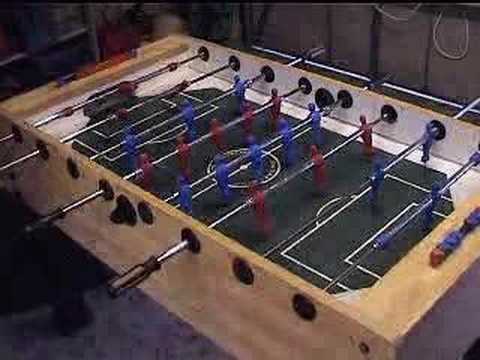 Ziel des Spiels ist es, mit an drehbaren Griffstangen über einer rechteckigen Spielfläche angebrachten (Fußball)spielerfiguren (aus Holz, Kunststoff oder Metall), eine oft vorgegebene Anzahl von Bällen ins gegnerische Tor zu schießen. 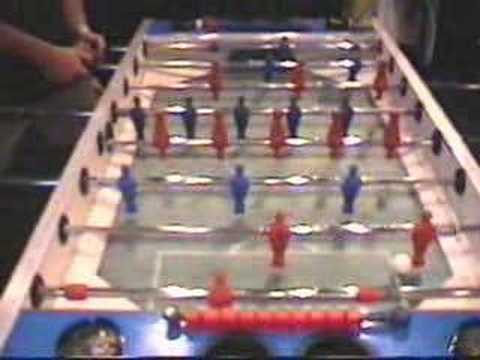 Spielfläche und Anordnung der Spielfiguren sind dabei dem Fußballspiel nachempfunden. 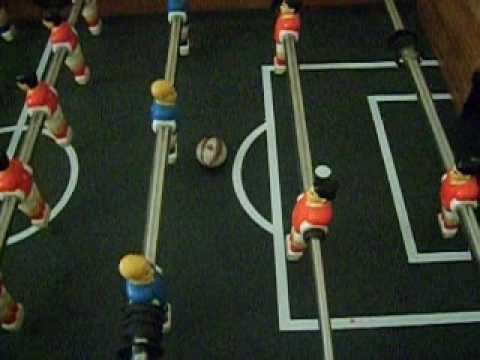 Ein Kickertisch hat normalerweise je 4 Griffstangen an den beiden Längsseiten der Spielfläche, an denen jeweils 11 Spielfiguren verteilt angebracht sind. Kickertische werden häufig in Gaststätten aufgestellt. Heute findet man sie auch als Spiel- und Sportgerät in vielen Wohn- und Kinderzimmern. Man geht davon aus, dass der erste Tischfußballtisch (in Europa) von dem Franzosen Lucien Rosengart entwickelt wurde. Lucien Rosengart war damals ein Mitarbeiter des Automobilherstellers Citroën. In Anlehnung an diesen ?Urtisch" (bei dem die Stangen noch an den Kopfenden waren) baute die schweizerische Firma ?Kicker", sesshaft in Genf, ihre Tische. Die Tische waren in der Schweiz, in Deutschland und Belgien so beliebt, dass das Wort ?Kicker" in Deutschland zum Synonym für Tischfußball wurde. In der deutschsprachigen Schweiz werden die Tische umgangssprachlich ?Töggelikasten" genannt, in Österreich oft ?Wuzler", gelegentlich auch ?Wuzlkasten". Das erste Patent auf einen Kickertisch sicherte sich der Spanier Alejandro Finisterre im Jahre 1937. Maßgeblich für die Entwicklung des ambitionierten Tischfußballsports in Deutschland war vor allem der Automatenvertrieb Löwen, dessen langjähriger Lieferant Leonhart ist. Löwen veranstaltete in den 1980er und 90er Jahren eine überregionale Turnierserie in Deutschland, die auch viele Topspieler aus den Nachbarländern anzog und deren jährlicher Höhepunkt die so titulierten ?Deutschen Meisterschaften" in Bingen, dem Hauptsitz von Löwen, war. 2000/2001 verlor Löwen aus wirtschaftlichen Gründen das Interesse an dieser Veranstaltung. So wurde kurz darauf von aktiven Spielern der p4p e.V. (Players 4 Players Tischfussballvereinigung e.V.) gegründet, um die Turnierserie weiterzuführen. 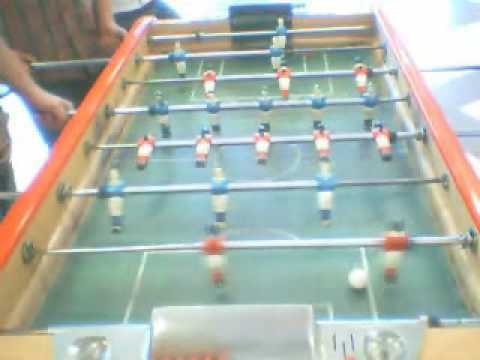 Table football, also known as gitoni, foosball, or babyfoot, is a table-top game and sport that is loosely based on association football. 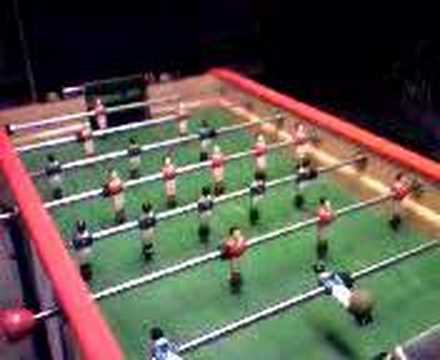 The most common English names are table football, footzy, bar football and foosball, though table soccer is also used. 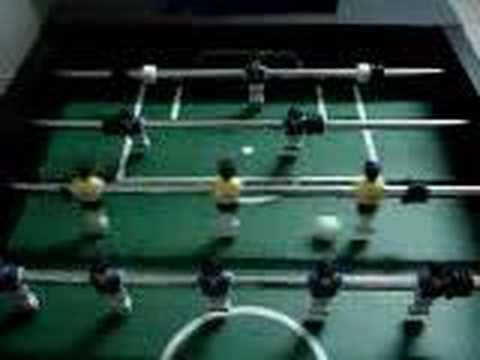 Among French-style players it is known as baby-foot. 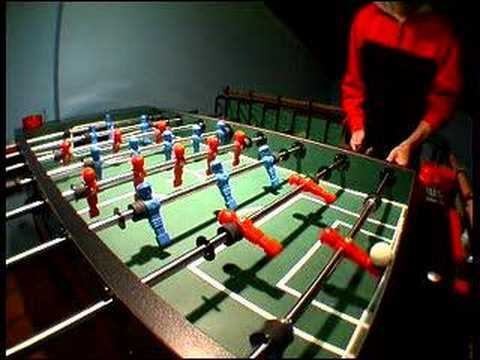 The name foosball is a loose transliteration of the German word "Fußball", which itself means simply football. 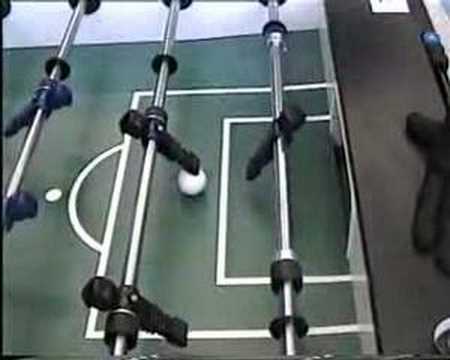 In Germany and in Russia the game is most often called Kicker. In Italy the most used names are gitoni, biliardino and calcio balilla. In Hungary it is called csocsó. Through Brazilian regions, it has received several names, like totó, pebolim or fla-flu. 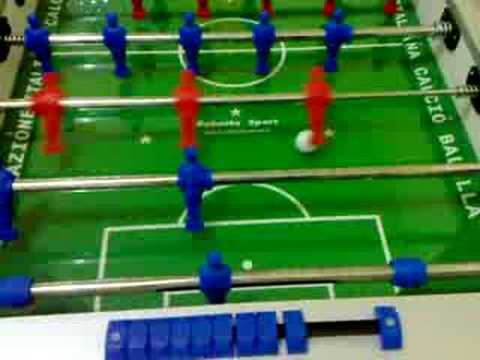 In Spain the game is called futbolín. 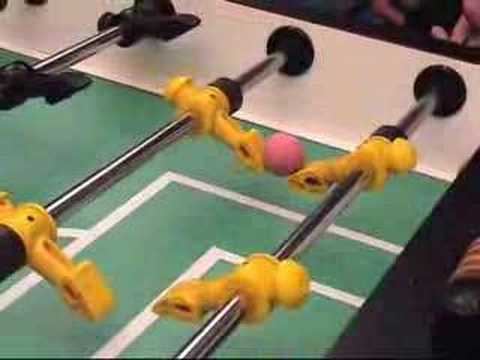 In Chile the game is known as tacataca. 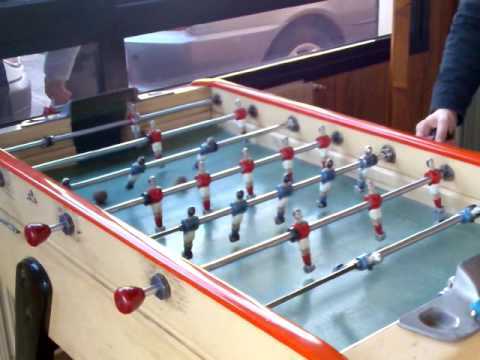 In Argentina, table football is known as metegol. 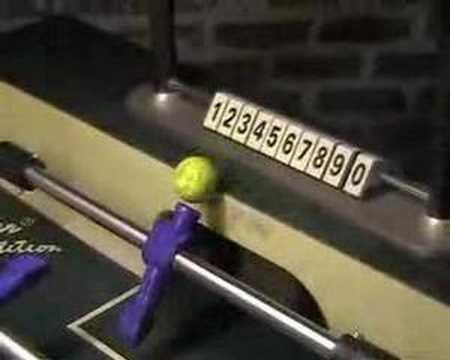 In Guatemala, the game is called futillo. 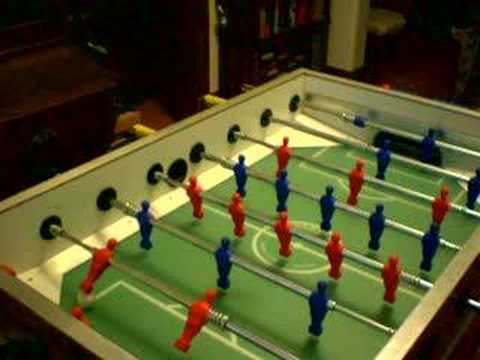 In Perú the game is known as fútbol de mesa. 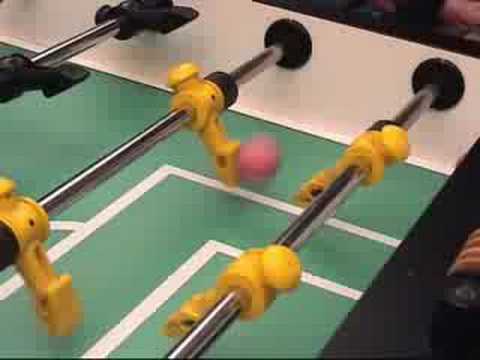 In other Latin American countries, it is known as canchitas or futbolito. In Bulgaria the game is called djaga. In Turkey the game is called Lang?rt. In Portugal it is called matraquilhos. 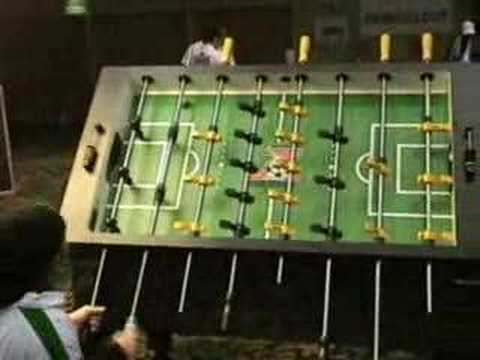 In the Netherlands the game is called tafelvoetbal. 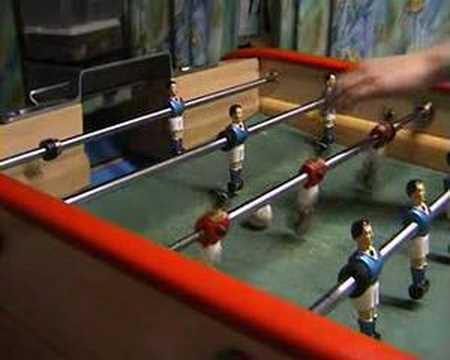 In Canada it is widely known as gitoni (where a gettone or token is required to play the game), foosball and baby-foot in Quebec. In South Africa it is called Ta-Ta box. In Poland it is called pi?karzyki which means "little football players". The concept was conceived after Harold had been to a Tottenham Hotspur F.C. football match (he was an avid supporter). He wanted to provide a game that replicated football that could be played at home. The inspiration came from a box of matches: by laying the matches across the box he had formed the basis of his game. 0:21 Min. 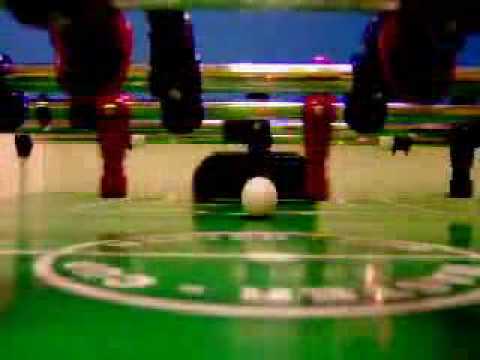 trickshot am lehmacher p4p 0:46 Min. 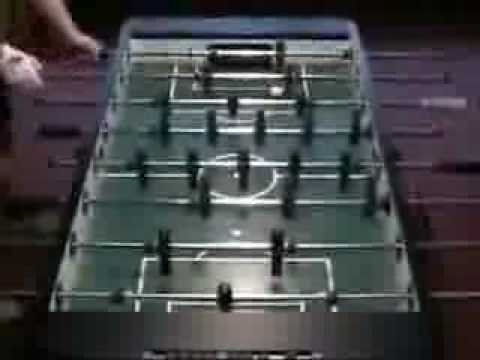 Tricks wie Ronaldinho aufm Tischkicker 0:14 Min.